Burn Rate measures how quickly your cash holdings are decreasing. Gross Burn Rate is the total amount of cash you’ve spent each month. Net Burn Rate is the difference between cash out and cash in. Profitable companies have a negative net burn rate because they are bringing in more than they are spending. Measuring Burn Rate allows you to forecast when you’ll run out of money (if you’re burning more than you’re making) or when you’ll be able to expand. Net Burn Rate is simple to calculate. It’s equal to your Net Income on the P&L statement, and usually stated monthly. To calculate it from scratch, add all expenses for the month and subtract all income for the month. If you’ve spent $500k this month, and brought in $250k in cash income, your monthly burn rate is $250k. Note that this cash income needs to actually be in your hand – not deferred revenue from future bookings. Gross Burn Rate is the total amount you’re spending each month. Add all expenses together to calculate the total cash you’re burning. Knowing your burn rate helps you understand your runway, or the amount of time before you go broke if you continue on the same trend. Your runway is the money you’ve got in the bank, divided by your monthly net burn rate. This gives you the number of months until Zero Cash Day (aka Doomsday). It might seem like Net Burn Rate is more important because most companies are happy if they have lots of runway and are growing. But keeping Gross Burn Rate low makes your company more sustainable long term. 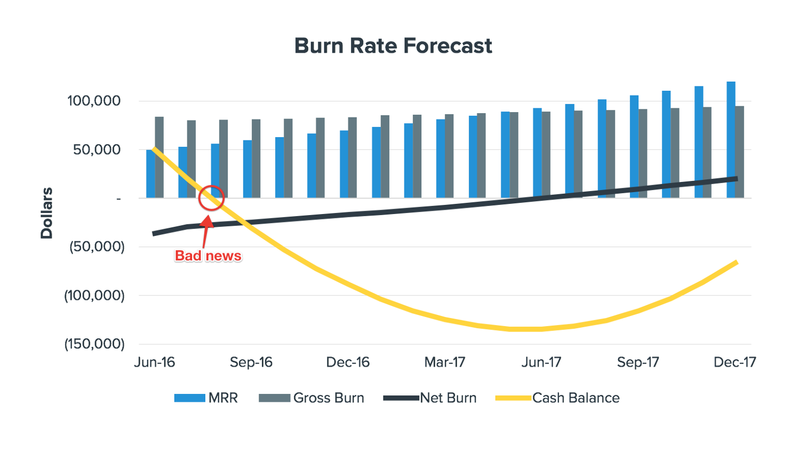 Say your Net Burn Rate is reasonable because you’ve had a couple good months of sales, so you increase your expenses (and therefore your Gross Burn Rate) expecting to grow. If all of a sudden your sales decrease, you won’t have a built in cushion anymore – and your runway will shrink quickly! Balancing the desire to grow with building a sustainable business is tough. As soon as you have that VC money in the bank, the desire to spend it and operate on a high burn rate is ignited. How quickly can you burn? Most startups want to keep close to a year of runway available at all times. If you’re under 6 months away from Zero Cash Day, you should be looking to either cut costs dramatically or raise funding. When you’re raising funding, VCs will look at your burn rate to determine how quickly you’ll spend their investment capital. For example, if you’re only burning $100k a month, and are looking to raise $5 million, it would take you 4 years to spend all that cash. Why raise so much now? What’s going to change? Unfortunately, cash doesn’t tend to stay in the bank for long. Mark Suster suspects that most startups will spend any VC money within 12 – 18 months of investment. If you’ve got money, you want to spend it. And if the market is good, more investment is available and you’re growing quickly (50-75% annually) it’s “worth it” to keep that burn rate high. But if your growth isn’t matching the money you’re spending, you’ll quickly be in a bad situation. Runway will decrease, investors won’t be as keen and you’ll need to make changes to stay sustainable.